Russia ’17 brings 15 Welsh arts organisations together to collaborate on a season of performances and events that capture the social and cultural impact of the Russian Revolution. As part of this season, the College is holding a four-day chamber music festival, Twilight of the Tsars. In the run up to and during the Twilight of the Tsars, Arts Management student, Lily Glover-Wright will be catching up with students around the College to hear about the roles they are playing in bringing the festival together. 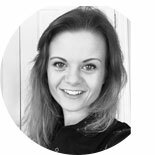 My name’s Lily, and I’m an MA Arts Manager working on the Twilight of the Tsars festival at the College, which will start on 16th February. I’m working with Grace and George who are both music students here at RWCMD. Together, we’ve been coming up with creative ideas to spread the word about the events and link the festival to the revolution theme. Our ambition is to get more music students talking about how they are involved in the festival. Tracking them down has been a bit difficult so far, and fitting in meetings around everyone’s busy schedules takes a bit of clever planning. Rather than trying to fit everyone in one day, I’ve had to be flexible, and arrange meetings throughout the week (and in between lectures)! 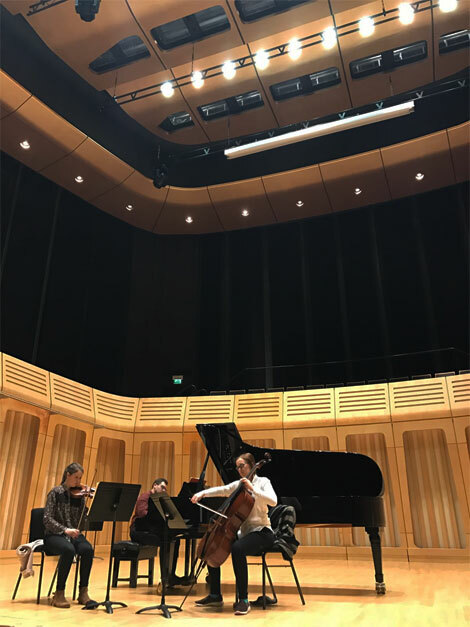 This week, Grace went along to a rehearsal (featuring George on piano) in the Dora Stoutzker Hall and got some great photos of the trio and some videos we’ll use in social media posts over the next few weeks. We’ve also been in touch with the College’s Junior Conservatoire, and are working on ways to include them in some student rehearsals. We’re hoping they might come along to some of the free concerts too! Next week, I’ll be meeting with Andrii who is studying MA Opera Performance, to discuss his part in the festival and his experience so far. I am also hoping to catch up with some of the strings performers, and fingers crossed, will be able to sneak into a couple of rehearsals too. Andrii started out working in business and finance, and singing on stage was just a distant dream; until he decided it was time to give up his calculator and turn his hobby into a full-time career. 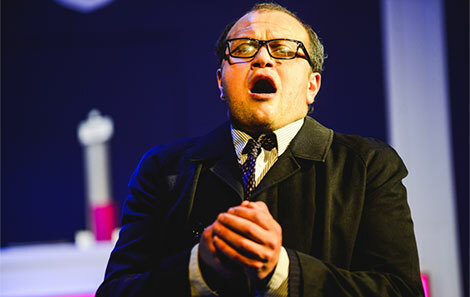 Since then, Andrii has gone from strength to strength, and made his operatic debut at the college last year, with support from Wales National Opera’s orchestra. Born and brought up in Ukraine, singing in Russian comes naturally to Andrii, and he was chosen because of his fluency in the language as well as his skill. When asked whether he found it hard to get used to acting on stage, Andrii described himself as a ‘stage animal’ and tells me he feels confident in characterisation and movement from years of practice in traditional dancing. He still likes to show off his moves occasionally – but mostly saves it for the club dancefloor! Although with limited performance experience, he took some private lessons before auditioning at the college, and things quickly fell into place at RWCMD. He tells me being on stage makes him feel like a fish in water – as natural as breathing to you and me! This will be Andrii’s first involvement with the orchestral festival. 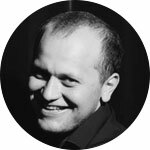 He will be presenting a solo song cycle by Georgy Sviridov entitled ‘Russia Cast Adrift’. This is a one-off performance, and is free to attend, so catch him while you still can! Final meeting of the day in half an hour! 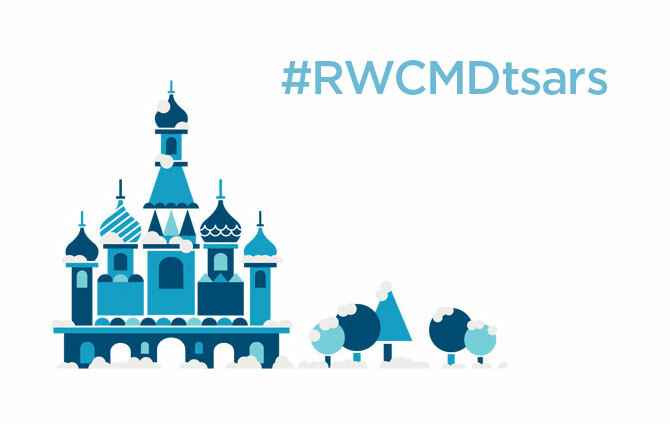 Making great progress in prep for #RWCMDtsars for #R17 … Fest kicks off in less than 2 weeks! Next time I’ll be catching up with Elian Quartet who will be performing Hadyn entitled ‘The Joke’ – op.33 number 2, in E flat major. 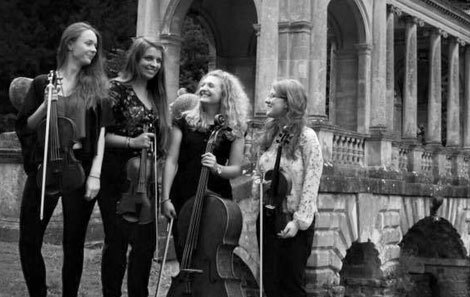 Students Abigail, India, Emma and Lily have been practicing as the Eilan Quartet since 2014. You can tell from the casual back and forth between them that they have formed a strong bond, from regularly spending 8-10 hours rehearsing together each week! As part of Twilight of the Tsars Chamber Music Festival, the quartet will be performing a piece by Hadyn entitled ‘The Joke’ – op.33 number 2, in E flat major. The piece is often nicknamed the ‘Russian Quartet’ and harks back to a time when chamber music was played in vast living rooms, decorated in grandeur. The Eilan Quartet have performed in the last two Chamber Orchestra festivals held at the College, and enjoy meeting the regulars and making time to chat to enthusiasts who travel to attend concerts all weekend. The quartet tell me they were sold on the College from the moment auditions took place. 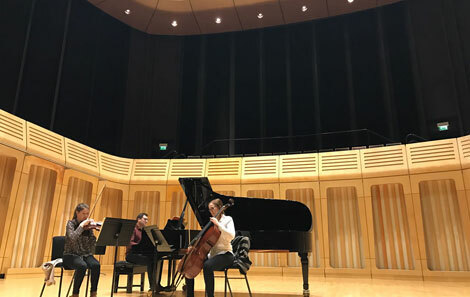 They were particularly taken with the friendly, community vibe at RWCMD, that perhaps is absent from some larger universities or conservatoires. 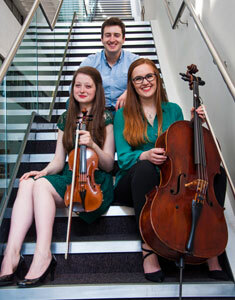 Their free performance takes place on 17th February at 5.30pm, as a precursor to the Endellion Quartet. They have been practicing hard for their performance, so please go along and support them, and like the Eilan Quartet’s Facebook page too! The Ballare Trio have had a busy start to the term. Pinning them down for a catch-up was difficult, with the players juggling a schedule that often starts at 8am and finishes close to 10pm each day. Katja Cross, cello and George Fradley, piano, are both final year BMUS students. Violinist Dayna Townsend is in her third year. They are very professional and driven, and have clear ideas of what’s next. Veterans at the Chamber Orchestra Festival, this will be their third year of performing at the weekend of events. They rehearse twice a week, spending a good few hours practicing. Dayna admits she is the only player that still suffers from nerves before a performance, and has to prod the others into action to get more rehearsal time in before a show. It’s no wonder they’re hard to find when they’re all so busy: George supports the Junior Conservatoire at weekends, is sourcing players for the festival, and plays alongside other performers in concerts during the week. Katja is busy developing her professional portfolio outside of college, and has already started working on recording music independently on tracks for pop songs and contemporary music. The Ballare Trio will be performing Rachmaninoff – Trio Elegiaque number 1 in G Minor. The piece was one of Rachmaninoff’s first compositions, and will be bought to life by these talented emerging musicians on Sunday 19th February at 4.30pm. We have set up camp in the foyer at our own welcome desk, and are attracting a fair bit of attention for a Friday afternoon. The college is very busy today – and I have had to send a lot of nervous looking newbies to reception for drama auditions. Amongst the crowds, Jazz time is being set up in the foyer, and a group of saxophonists in Hawaiian shirts are gathering. The Endellion’s arrive looking calm and collected, having played together for 27 years, they have experience on their side. I find them in their dressing room playing cards and telling jokes, they have a very warm and friendly manner about them. Their performance is faultless, and draws an audience of avid followers and classical music novices such as myself. I have never attended a classical music concert before, and notice how different the audience etiquette is to any other type of performance I’ve attended – no one claps in between movements! Following their performance, string soloists from the college perform a late-night concert led by Lucy Gould. The orchestra are fantastic, and brighten up the stage, dressed in vibrant pops of colour. Lucy leads energetically and with an admirable assuredness, which the students follow with great skill. A terrific introduction into classical music events! Evening concerts in the foyer were backed by a vibrant sunset shining through the Bute Park trees, which made for a beautiful setting. I watched a couple of passers-by stopping at the front doors and coming in, settling in at a table inconspicuously. A girl in vibrant green running gear managed to somehow walk in unnoticed, such was the audience’s captivation with the wonderful performers onstage. The Gould piano trio’s performance of Rachmaninov drew the largest crowd of the weekend so far, and audience members left in a buzz of excitement. The late-night concert had an equally impressive crowd, where members of the trio were joined by guest musicians; many of them tutors at RWCMD. We left at 11pm feeling tired and somewhat sad that much of the weekend was already over. Concerts are already in full-swing when I arrive at RWCMD to take over from Grace on the welcome desk. Four harps have been lifted onto the stage, and a large crowd has gathered in the foyer. The festival finished with a magnificent performance by the Gould Piano Trio of Tchaikovsky’s ‘Piano Trio in A Minor, Op 50’. Lucy Gould pre-warned the crowd that the piece was almost ‘comically long’, but the minutes flew by as the trio played the piece with passion and skill. As we packed up and sold a few more CDs to late leavers, we congratulated each other on the success of the weekend. I can safely say I am now a fan of live classical music, and greatly admired the talent shown by the visiting performers and students from RWCMD, across the weekend.